Vary the fabrics used for the baskets to suit the season or occasion and add some interest by texturizing part of the basket with Bosal Stitch & Steam. Spring-time fabrics make a basket perfect for Easter egg hunts or a spring table centerpiece. Try Valentine’s fabrics for a candy basket or to carry Valentine cards to someone special. Choose Christmas fabrics for a basket perfect to hold a hostess gift. 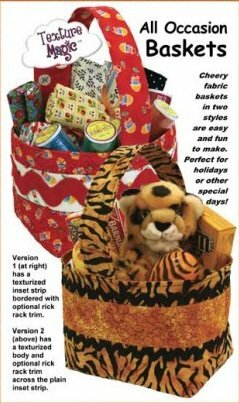 Or pick a fabric appropriate for the recipient and make baskets to use as gift baskets for any occasion through the year.